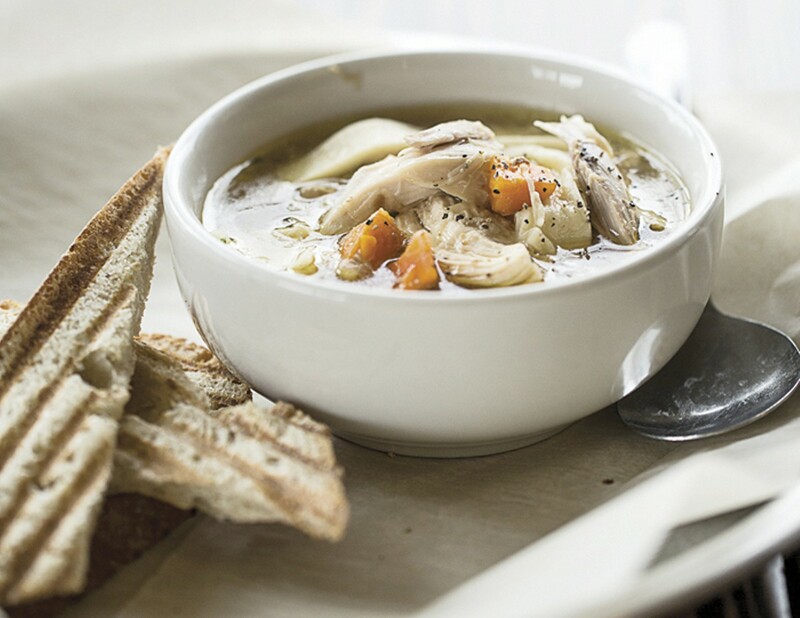 Grove East Provisions’ chicken noodle soup — an excellent choice on a chilly day. When Barry Kinder was living in Europe, he loved popping into his neighborhood corner market to pick up a bottle of wine and some simple provisions. When he moved back to St. Louis, he noticed these types of places were missing from the local food and beverage scene, so he decided to open one himself. Armed with a knack for rehabbing buildings, he turned the one on the corner of Arsenal and Minnesota into Grove East Provisions, a small bodega and sandwich counter. Here, Kinder prepares classic pressed sandwiches — ham and cheese, say, or a turkey, bacon and ham club — to order, and offers daily soups and specials based on whatever he's growing out back in his garden. His chicken-noodle soup alone is worth a visit. At night, Kinder plays around with dinner specials, inspired by his time cooking at an upscale restaurant in London (George Michael was a regular). Add to this his partnership with Red Fox Baking, which shares the kitchen and provides bread for the sandwiches, and it's no wonder Grove East Provisions has quickly become a neighborhood hangout. 3101 Arsenal Street, St. Louis, 63118. 314-802-7090, www.facebook.com/pages/Grove-East-Provisions/670238153049198.